SHREVEPORT, LA — Icelandic sculptor Steinunn Thórarinsdóttir (Steinunn Þórarinsdóttir) will visit Centenary College’s Meadows Museum of Art Friday, October 19 to guide visitors through her outdoor sculpture series, Borders. Thórarinsdóttir’s Borders includes eleven pairs of life-sized figurative works in cast iron and cast aluminum and will be exhibited on the Centenary campus throughout the 2018-2019 academic year. It is the second installment in the Meadows Outdoors sculpture series sponsored by the museum. The Borders artist walk begins at 5:00 p.m. and is free and open to the public. The Friends of the Meadows, a non-profit organization supporting the Museum, will also host an after-party following the artist walk. It is open to current Friends of the Meadows as well as those who wish to join at the door. 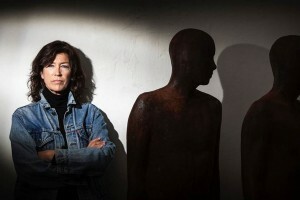 Thórarinsdóttir has been working as a sculptor for almost 40 years and has exhibited her work in museums, galleries, and public spaces around the world. She has often created androgynous and deliberately anonymous human figures as a means for exploring the human condition and the ways in which humans relate to the environment and to each other. Borders debuted at the Dag Hammarskjöld Plaza at the United Nations Headquarters in New York City in 2011 and has since appeared in Seattle, Dallas, Chicago, and Baton Rouge. The figures in the exhibit are meant to be understood as symbols of humanity and cultural diversity, commenting on division and unity and emphasizing the fact that all humans are connected despite our differences. For more information on Borders and Thórarinsdóttir’s work, visit themeadowsmuseum.com/upcoming.